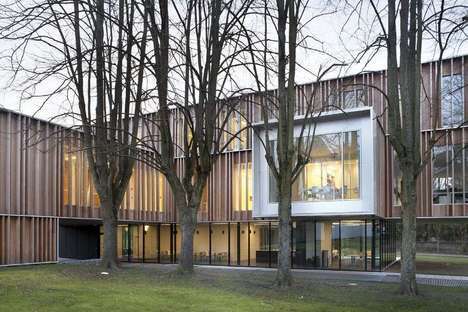 V+ and Bouwtechniek won the competition for expansion of the town hall in Montigny-Le-Tilleul (Belgium). Their project has adapted the old town hall to suit its new functions and used the green area behind the existing 18th century building to create a new wing, a lightweight construction which clearly stands out from the old town hall. 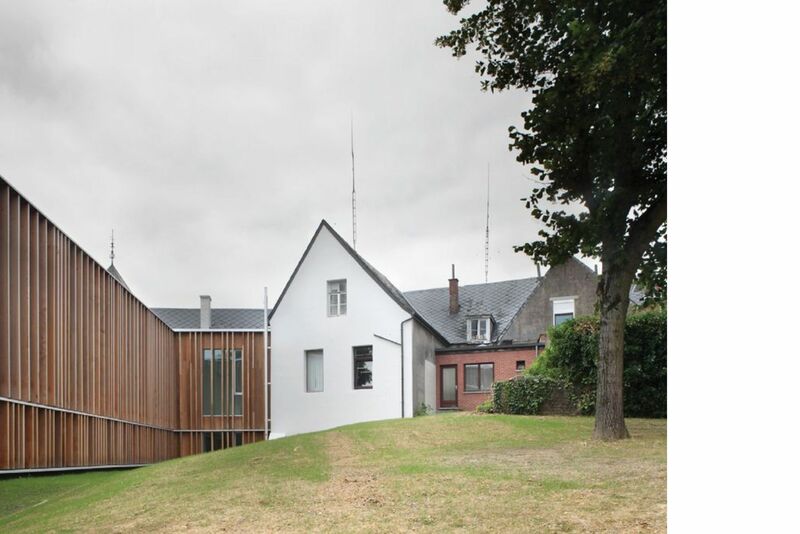 The temporary association of studios V+ and Bouwtechniek has renovated and expanded the town hall in Montigny-Le-Tilleul, in the Region of Wallonia, Belgium. 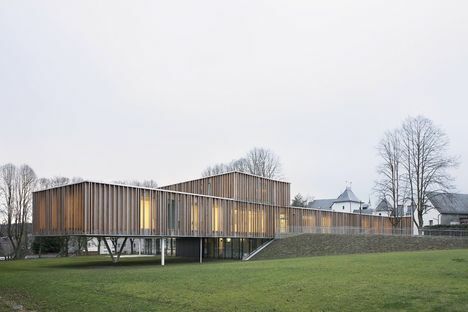 Following a competition announced in 2008, V+ and Bouwtechniek’s project not only adapts the old town hall in Montigny-Le-Tilleul to suit new functions but recovers an unused green area behind the building to create a plaza and park for public use in the town. 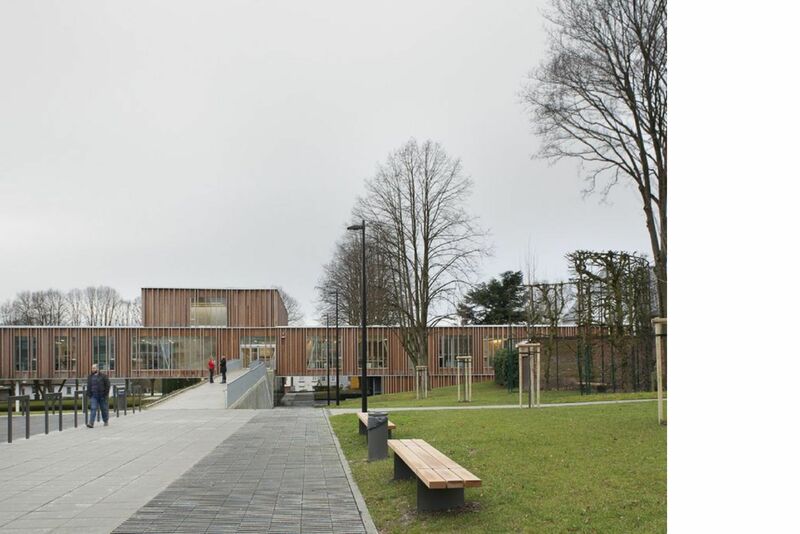 V+ and Bouwtechniek’s project demonstrates great respect for the existing building, which has been freed of numerous functions now moved to a new building constructed in contemporary style which establishes an important link with the park. While the 18th century town hall faces Rue de Machienne, the new complex starts off there and extends over the lot behind it, literally diving into the park with a surprising overhanging volume. The new volume takes advantage of the difference in level between the ground floor of the old building and the park three metres below it; the glass walls of the cafeteria, on the same level as the park, take advantage of this solution to emphasise the beauty of the overhanging structure. According to the architects at V+, the layout of the main floor in the new block is inspired by a branch in the stand of linden trees which forms a ring around the lot on which the town hall stands, up to the new parking lot to the west. 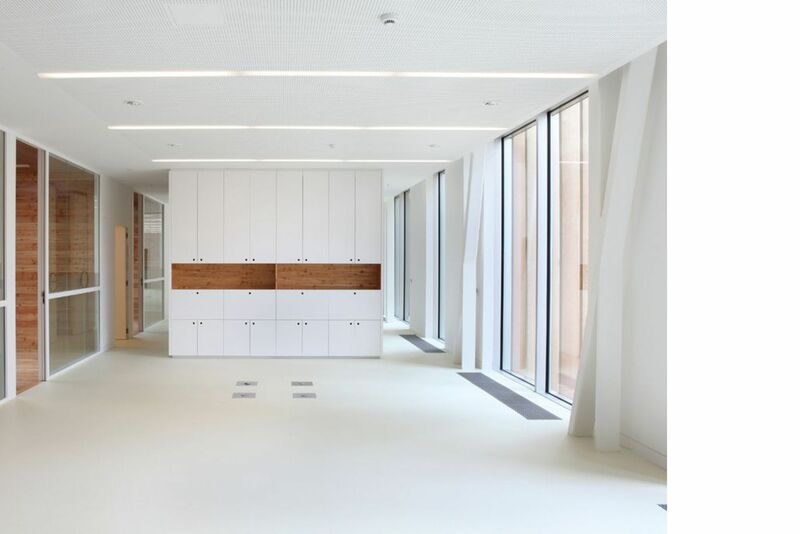 The primary trunk extends into three shorter branches, each of which contains one of the building’s most important institutional departments, Direction, Planning and Finance, from which two overhanging areas containing very special meeting rooms branch off. All the supporting elements are around the outside of the building, so that its internal layout, separated by non-weight-bearing dividing walls, is flexible and reconfigurable. The metaphor of the natural world is confirmed by the sunshades made of vertical strips of cedar wood which shade the two overhanging levels while offering glimpses of its lightweight structure and wood and glass infill. About halfway along the new “branch”, a ramp offers users access to the public area at the side, connected with the parking lot, without any architectural barriers. The relationship between the old town hall building and the new volume suspended over the park is a dialogue of contrasts in which the architects never imitate the old building. Masonry and decoration finish where steel, glass and wood begin: the historic façade opens onto the park with a series of modernist façades in which wood joins the building with the natural landscape and glass allows users to enjoy it. The latest climate control techniques complete the project, making the town hall a “passive building”. The people of Montigny-Le-Tilleul can see the entire volume of the building at first glance. The simplicity of its shapes and its skeleton, shaded only by the wooden sunshade, give it something in common with the imagery of auxiliary and temporary structures, but the lightness of the whole suggests that the construction has permanently entered the landscape. Collaborators: Elodie Degavre, Philippe Buraud.